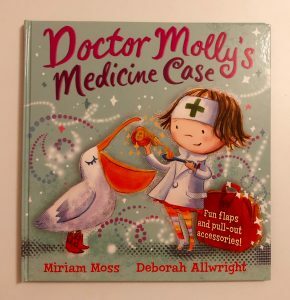 If your little one is feeling under the weather then this funny book about an unusual doctor and his patients may be just the thing to cheer them up. 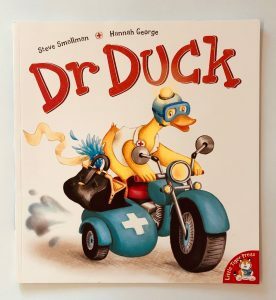 When the animals at his zoo start to fall ill, the zookeeper decides to call the local doctor – Dr Duck! When he arrives he discovers a porcupine who has sneezed so much that all her spines have shot out, a giraffe with a stiff neck, a snake with a high temperature, a mildly depressed hyena and a gorilla with wind. Dr Duck’s cures are unconventional to say the least but they seem to work and soon everyone is feeling better and relaxing in the hot tub. Everyone that is except the poor farting gorilla. Dr Duck had prescribed some large pants with extra strong elastic to trap the smell of his stinky bottom burps – but the knickers have blown up like a balloon and the gorilla has floated off in to the sky. Can the ingenious doctor find a way to bring him back to earth before its too late?